What people are saying about Vern. The workshop with Vern was enlightening and thrilling, and very productive. I learned so much and came away with new tools to use right away in my photography. Vern's teachings and dedication to his vision and artistic aesthetic have truly inspired me. I chose to work with Vern in order to improve my photographic skills, from an intermediate to a more advanced level. I feel that our 2 &1/2 days together were imminently successful. He helped improve my knowledge in all aspects of the photographic experience, such as: site selection, technical pearls, Light Room sorting & editing, as well as printing. I left with six strong images, of which three I would consider being of publication quality. There's no way I could have achieved that without Vern's capable and patient instruction. For me, this workshop will always stand out in my mind as one of the most amazing things that I did in my life! It is what life is all about and I thank Vern for making that possible for me! Now I just have one problem... I want to go back!!! I can’t wait to do another workshop! 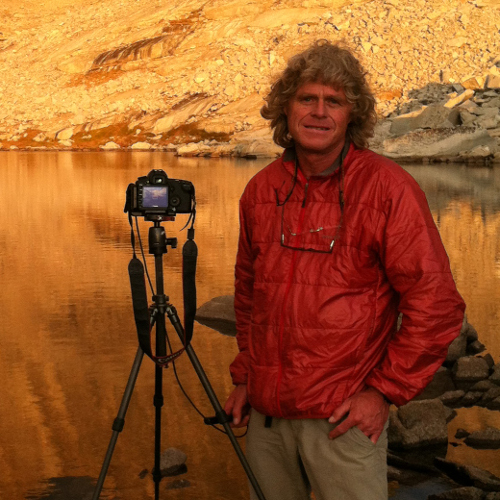 To appreciate the Sierra Nevada range’s jaw-dropping beauty, drop by Vern Clevenger’s gallery in town. (Mammoth Lakes) His color photos (prints start at $149) of nearby canyons, lakes and mountain vistas are ubiquitous around town, as is the man himself. Vern’s scruffy yellow jacket and unruly hair have been a familiar presence at Mammoth since the early ’70s. He is a modern-day version of Ansel Adams, who more than anyone put this corner of California on the map.